Many law enforcement agencies across North America use Global Positioning System (GPS) to monitor and track probation, parole, or day-release program participant activity. GPS monitoring has proven to be a valuable tool to help ensure that a participant remains within a certain area or out of restricted locations. This supports a healthy and safe community for all. The participant is equipped with a GPS tracking device. The device captures latitude and longitude coordinates from a minimum of four satellites. Location data along with date, timestamp, and rate of travel (speed) are processed. 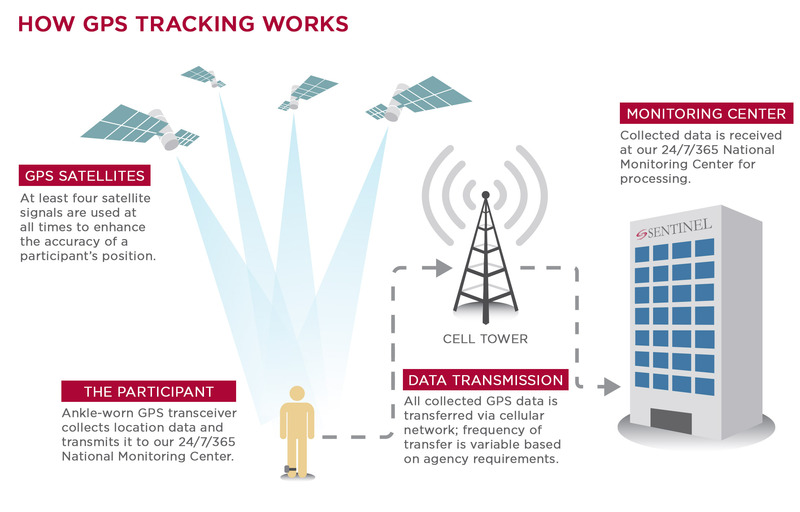 Data is collected by the GPS device and transmitted to the Sentinel National Monitoring Center via cellular communication. Sentinel DNA software stores and reports the device location and status. Based on a predetermined protocol with the agency, officers are notified when a violation has occurred.